Matter undergoes changes in state as heat is continuously applied to it, why does this happen to understand it we have to look inside the matter, using kinetic theory. This animated science topic gives in-depth information about kinetic theory and is very useful for high schools, college and industry. Why solids have a definite shape and volume ? Why liquid do not have a definite shape ? Why gases have neither a definite shape or volume ? 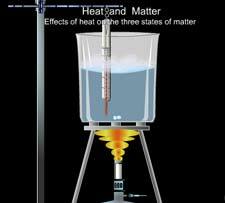 What is the effect of heat on the three states of matter ? What is melting and melting point ? as the temperature increases, the average speed of the movement increases. According to this theory, the temperature of a body is a measure of the average kinetic energy of it particles. This theory can also be used to explain the differences between the different states (or phases) of matter. The particles vibrate around fixed positions. They are close together and so attract each other strongly. This is why solids maintain their shape. The particles are still relatively close together but now have enough energy to "change places" with each other. This is why liquids can flow. Average distance between particles typically 10 times greater than in solids and liquids. The particles now move freely at random, occupying all the space available to them. 100 people in you living room, all glued to the floor. They can all move a little but can't move their feet. Your room full of moving (liquid) people is now given some even higher energy food. They now have enough energy to break the door down (and some of the walls too). This means that they can spread out because they can get outside - just like a gas. Solids are made up of particles which are attached together and can only vibrate back and forth. Liquid's particles are still held together but are able to move around each other. Gas has particles which have enough energy to have broken the bonds that held them together as a liquid. Ans: What is happening is as water is evaporating through the walls, it is taking the heat away from the rest of water molecules inside the pot, a black colored pot absorbs more heat and helps in evaporation through its walls. The KE of water molecules that escape to the atmosphere increases till they can break the bonds in the process they collide more with molecules and increase in speed, thus actually taking more heat away. Porous walls only provide an outlet, in absence of which, the water molecules will keep on switching between evaporation and condensation inside the pot. Ans: Kinetic energy and the molecules can bring about the phase change. In liquid water, molecules are close but several groups of moles are clumped together and moving briskly, take out kinetic energy rapidly from the molecules, they slow down and subsequently nearly stop, this increases the force of attraction between them, causing bonds to form and results into a solid (ice). The reverse happens when the kinetic energy is increased in liquid water, the groups move faster and faster till they break the bonds apart and convert into individual molecules and form a gas. Ans: Plasma is an ionized gas but not a gas. Plasma is considered to be a distinct state of matter, apart from gases, because of its unique properties. It has one or more free electrons, which are not bound to an atom or molecule. The free electric charges make the plasma electrically conductive. It is closely related to the gas phase in that it also has no definite form or volume, however in gas, all gas particles behave in a similar way, influenced by gravity, and collisions with one another but in plasma, electrons, ions, and neutrals can be distinguished by the sign of their charge so that they behave independently in many circumstances, with different velocities and temperatures, allowing phenomena such as new types of waves and instabilities. This makes it a fourth state of matter. Ans: If there is no leak the pressure will remain constant, what is the doubt here? Ans: Air being a gas undergoes expansion as the temperature increases. Heat of the day added to the heat generated due to friction of tires on the road couples to produce high temperature as the air expands it can blow up the tube, causing accidents. Ans: Cold air is denser and heavier than hot air. A hot air has more kinetic energy which allows it to act against gravity also being less dense makes the atoms take up more space and therefore makes it less dense and lighter, hence it rises up, while colder air due to higher density and lower KE falls. Ans: Steam burns do have to potential to cause more damage than scalding. The reason has to do with the latent heat of vaporization. To convert 1 gram of water to steam requires about 540 calories ( latent heat of vaporization needed to break bonds) . The energy in the steam is 9-fold greater than the energy in the 1 gram of water at the boiling point (100 degree Celsius). This energy (as heat) is released when the steam condenses to water on the skin and the water cools to the temperature of skin. Steam will be substantially more injurious. Ans: Macroscopically - osmosis is the rise of water separated by membrane in a u-tube in the portion in which solute is added. Kinetic theory explains this at microscopic level or molecular behavior of water when a solute is added – more in terms of hydration cells formation, which pulls water through membrane, another kinetic theory is based on osmotic pressure due to collision of water molecules. This is in contrast to popular diffusion theory based on concentration gradient of water. Ans: Evaporation is primarily a surface phenomenon. It takes place at all temperatures – molecules at the surface of a liquid receive enough kinetic energy to break free from attraction of other molecules and escape while boiling takes place only at a specific temperature. It takes place all over the liquid, all the liquid molecules attain the boiling point and they escape from all depths of a liquid. Ans: The difference between phases is kinetic energy of molecules; take out energy rapidly from the molecules the phase transition of vapour (or gas) to solid called deposition occurs, due to increased intermolecular attractions. Temperature has to be below freezing point for physical vapor deposition (PVD. At -78°C carbon dioxide becomes a solid called dry ice. At frost point, ice forms on a solid surface, this is a solid deposition of water vapor. This is how snow forms in clouds. Ans: At macro level Pressure is force per unit area it acts in all directions at a point inside a gas. At the surface of a gas, there is a pressure force (equal to the pressure (force/area) times the surface area in a direction perpendicular to the surface), a vector quantity that acts perpendicular to the surface. 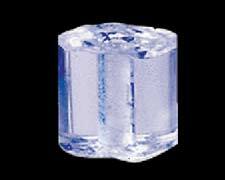 At micro level – it is collisions of molecules with the walls and surfaces of container that denote pressure. Ans: Take a cup of ice, another of hot coffee and in a third cup mix some ice and hot coffee, put lab. Thermometers in each and take temperature readings. In the mixture, the temperature comes down faster. 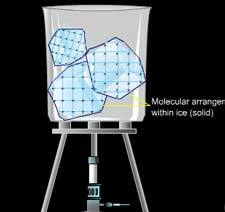 Explain on basis of the H2O molecules in ice take energy from H2O molecules of coffee, break bonds, and melt. Those in coffee give up energy and cool down, until equilibrium. Unmixed hot coffee cools down slower. We are uploading an animation on this soon.